Alexander the III of Macedon, more commonly known as Alexander “the Great,” impacted the ancient word in so many ways while he was alive for his brief thirty-two years and continued to do so in the decades following his death. He briefly unified most of the Greek speaking world under one government and his rule marked the beginning of what is known as the Hellenistic Period, when Greek culture was spread to the Near East. Because his rule was so important, much is known about his life, but one aspect of Alexander the Great’s life that remains somewhat of a mystery is his death. Alexander the Great’s death has been the source of conspiracy theories for centuries, most recently promoted on a large-scale by filmmaker Oliver Stone in his 2004 biopic of the king, Alexander. The crux of the conspiracy theories are that Alexander was poisoned by one or more of his trusted generals in an effort to usurp his empire and there certainly are ancient sources that support the assassination theory. On the other hand, there is also an ancient source that says otherwise and most modern scholars believe that Alexander succumbed to more natural causes. An examination of both arguments comes down in favor of death by natural causes, although the true answer may never be known. As soon as he became king, Alexander wasted little time building the largest army in the Greek speaking world and preparing for the greatest invasion in the history of the world until that time. 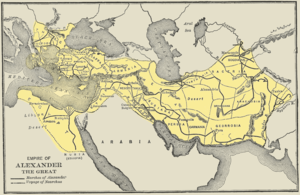 He left Macedon with his army in 334 BC and within ten years he had conquered the Achaemenid Persian Empire. After taking his army to the banks of the Indus River, his men forced him to turn back and return to Babylon, which is where he would die. The basic outline of the context of Alexander’s death is known, but the details remain enigmatic. While he was assuming his new throne in Babylon, Alexander managed to create some enmity with his loyal Macedonian soldiers when he integrated 30,000 sons of Persian nobles into his army and dismissed 10,000 Macedonian veterans whom he determined to be either too old or too injured to fight. The king was in no mood to deal with dissent, so he had the most vocal of his Macedonian opponents executed, which caused further dissension in the ranks. He then died on June 11, 323 BC after a ten day fever. The timing of Alexander’s death coming so soon after his problems with the Macedonian army led many in the ancient world, and today, to believe that he was murdered by those closest to him. The case for Alexander being assassinated is supported by two notable ancient historians, the second century AD Greek historian Arrian and the first century BC Greek historian Diodorus Siculus. Both accounts state that the assassination originated with Antipater and his family. Antipater was a Macedonian general and confidant of Philip II and then Alexander the Great. 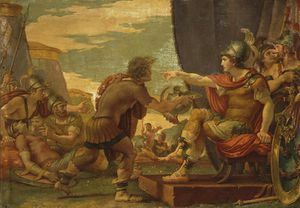 He was a scholar who is credited for having written the no longer extant, On the Deeds of Perdicass in Illyira and was one of the first generals to support Alexander after Philip was assassinated. It would therefore seem most unlikely that an assassination plot would come from Antipater or his family, but the close relationship the men had in Alexander’s youth appears to have soured after he became king. When Alexander left to conquer the Achaemenid Empire, Antipater stayed behind in Macedon but his sons Cassander and Iollas were by the king’s side. They were said to have openly laughed when the Persians prostrated themselves before Alexander and rejected the king’s claims to divinity. Antipater’s sons were not alone, though, in their questioning of Alexander’s acquired Asian styles, as most of the Macedonians also rejected seeing him as divine. The rift apparently widened when Alexander charged Antipater with sending fresh Macedonian troops to Babylon. By 323, just before Alexander died, the contingent had not left, which led to complaints against Antipater. According to Arrian, these events are what led to Antipater and his family assassinating Alexander. Diodorus’ account primarily concerns events that took place later between Cassander and Olympias for control of Macedon, but mentions in passing that Alexander was poisoned. Today, most scholars believe that the fever Alexander died from was natural, or as natural as a fever could be in the fourth century BC. Death by fever is a much more logical conclusion to draw when one considers the circumstances. Alexander sustained wounds in battle so he very well may have acquired an infection, not to mention that sanitary practices were far from what they are today. Also, he left behind no legitimate heir so Alexander’s death was of no immediate benefit to Antipater and his family. The final point to consider in the argument against Alexander having been assassinated are the sources themselves. Besides probably being the result of a propaganda campaign, they were written much later and therefore can be considered apocryphal. Not only that, but one must also consider the writings of the first and second century AD Greek biographer, Plutarch. The Greek biographer was adamant that Alexander did not die at the hands of others. The theory that Alexander the Great was assassinated by those closest to him has persisted for centuries and will no doubt continue to do so despite evidence to the contrary. It is certainly more exciting and salacious to think of one of the greatest conquerors in world history being murdered by one of his trusted men than for him to have died due to illness. But the reality is that logic and the sources indicate that Alexander the Great’s monumentally important life was cut short by an enemy that he could not see – either a virus or a bacteria.